Point a hidden camera at the wheel, and a computer tells you where the ball will land . . . sound like a fantasy? It’s not. It’s the Hybrid Roulette Computer – by far the most effective roulette prediction device available anywhere, and the most effective way to win at roulette. It is no exaggeration to say this technology makes millions. The Hybrid is not available anywhere else. Although we use it ourselves, there are too many casinos world-wide for us to apply it in all casinos, so we can sell a few of them publicly. The Hybrid can and likely will earn you millions if it’s used correctly. The technology is not to be taken lightly. We do not offer it to just anyone – you must meet us personally and meet specific requirements. Below are some video demonstrations. But you can see a demonstration in-person and on any wheel you want. We can also show you videos of real play in real casinos (shown to serious players only). The Hybrid is for larger and more serious teams who aim to win very large sums. You get predictions earlier. Accuracy is higher, and you can earn much more than with typical computers. in this video we start applying the roulette computer from scratch, so you see most of the process. The audio is censored. To monitor the accuracy, pay attention to the “tuned predictions” displayed in the software. The tuned predictions begin to be displayed after the first few spins. Predictions become more accurate over time, and reach the maximum accuracy after about 70 spins. At that point, the players usually start betting. In this demo, after we test the 70 spins, we clear the charts and repeat more spins so you can see what the accuracy would be like once betting begins. Keep in mind this is a current model Juhn Huxley wheel and with a deliberately bouncy ivorine ball, to make winning more difficult than most wheels. The most reliable assessment of edge is by observing the center points of the peaks (the high parts of the wavey green line for the chart with the most data). In this case the high points are at 2.95 and 2.25. So the edge is approximately +34%. This is about the average edge for a difficult wheel that’s in good condition, and with a bouncy ivorine ball like in the video. Obviously even better results are achieved if you take the time to focus on easier wheels. Edges over +90% are often achieved especially if the computer is configured to notify players when the ball is predicted to bounce ess predictably (but this setting takes longer to use). But more important than edge is “profit per hour”. And normally we would bet about 5 numbers for each predicted number (the predicted number and 2 numbers each side). In 70 spins, the profit was $6,800. In the 29 spins, the profit was $1,750. The edge in the betting period was lower than expected (as per the longer term data). This is what we’d call “bad luck”, although it’s still a clear profit. Hypothetically we could have bet on 15 or so numbers and won on almost every spin for an even greater profit. But this is not possible on all wheels. Usually a well-organized team can get 5-10 numbers down in a spin before bets close. There’s a lot more to it, but the video is a just a basic demonstration of typical accuracy on a very common wheel. We have conducted many demonstrations of our technology to both large and small audiences. This includes the roulettephysics.com roulette system, and our electronic technology. On most occasions though, group sizes range from 1 to 15 individuals. Image left: One of our demonstrators exhibiting our Hybrid Roulette Computer. The actual camera for the Hybrid can be miniature and kept close to the wheel, or hidden as far as 50 meters from the wheel. It can even obtain a view of the wheel from ceiling reflections to ensure line-of-sight. We prefer to keep groups small and personal. Demonstrations to larger audiences are more to establish clear proof of effectiveness with many witnesses, whereas demos to smaller audiences are more for serious players who have intent to purchase our technology. If you are seeing a demonstration with intent to purchase, you are required to sign a non-disclosure agreement, and there are other requirements specified on the purchase page. If you are merely curious, you can attend a larger group demo, although such public demonstrations are censored, and you only see what you need to see to know without a doubt our claims are accurate. For example, at a larger group demo, you will clearly see accuracy rates of 1 in 10-15, but you will not be permitted to inspect the equipment or be privy to information relating to its operation. But if you attend a personal demo with intent to purchase, you will see everything. Additionally, at any of our demonstrations, you can see other roulette cheating devices – you can test them personally and decide for yourself if competing devices are scams. Most roulette computer devices are scams and only capable of beating old or poorly maintained wheels. 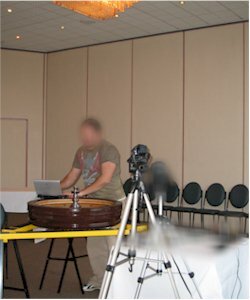 At our public demonstrations, you will also see the roulettephysics.com roulette system which does not use any form of electronics, and is legal throughout the world. It can be applied at some online casinos depending on footage quality, but it is more designed for real casinos. See recommended site for online casino comparisons. Image left: demonstration of other cheating devices available. How they work and why they are ineffective. If you wish to purchase censored video or audio of a public demonstration, or to attend a public or private demonstration, please contact us. How Effective is the Hybrid? Once the camera is aimed, the equipment automatically predicts where the ball is most likely to land. The ball and wheel speed is measured automatically, so there is no human error involved, and user skill or fatigue is irrelevant. 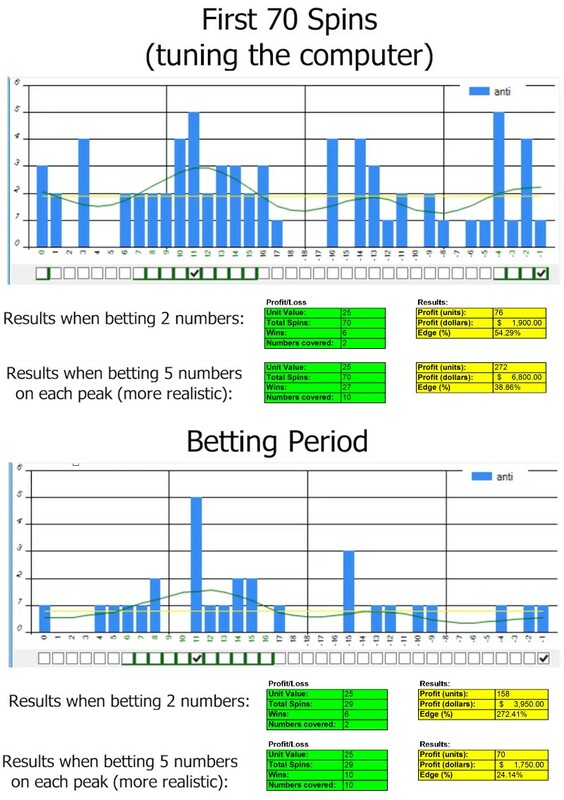 This enables extremely accurate and early predictions to win, without many manual clicks of a button (as is traditionally done), and without the user needing to even look at the wheel. Predictions are relayed to one or more players, and if you bet on just one number, you win once about every 10-15 spins, without even needing to look at the wheel. This is an enormous edge over the casino, and it’s completely covert. Accuracy rates vary, but the typical edge is between 40 – 120%. Contrary to popular belief, this computer system is actually LEGAL in approximately half of the world’s casinos. This is because most gaming laws state that a player may not force or influence the outcome of spins, but they do not at all state your cannot “predict” spins. This provides Hybrid players with a unique and perfectly legal strategy for earning potentially millions (literally millions). It will not be an opportunity that will last forever though. 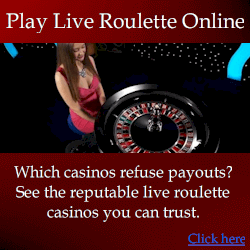 But legal or not, of course casinos don’t like you applying such technology to beat roulette. If they find you are using a cheating device, they can and will likely ban you. This is why such cheating devices must be applied covertly. Purchasers are told exactly where the device is legal as per the latest research. However, purchasers should always do their own research for confirmation. There are different versions of the Hybrid, and many equipment options available. Ultimately the options you choose determines the price. The approximate price range varies between US$25,000 – US$80,000, which is a small price considering your investment can be returned within 24hrs of play (However, realistically you should not win too much too soon – you should win discretely to avoid detection). Includes all image recognition equipment, data processors and wireless earpieces. This version requires 3 players, and realistically requires a female team member with a handbag to hold the equipment. The electronics easily fit in the lining of a handbag. The other two players are primarily bettors. Includes all image recognition equipment, data processors and wireless earpieces. This version requires only 2 players, but can covertly transmit the prediction to any amount of bettors, although 2 bettors is usually the most you’ll ever need. It is significantly easier to setup and switch between different wheels than the V1 model. The “Remote Hybrid Roulette Computer” is the latest, most powerful and the only version of the Hybrid Computer available. A hidden camera streams video outside the casino to a server via wireless internet. The server receives the video from another country, then tells players where to bet. Browse our site and learn more. To acquire our Hybrid, please first Contact Us to schedule a meeting in person with us. You will witness a full demonstration on a real wheel and see full capabilities before purchasing. If you are not interested in electronic devices, learn about the roulettephysics.com roulette system.